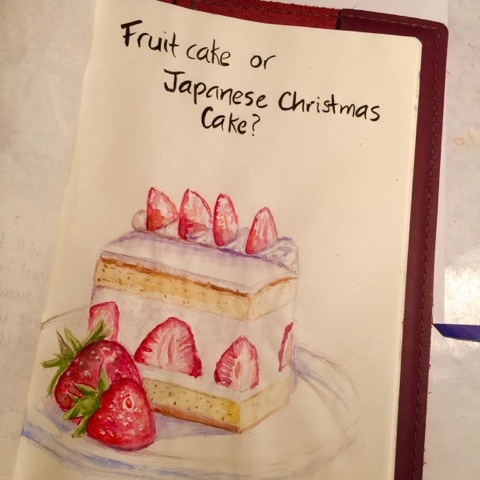 Art By Yukari: Fruit Cake or Japanese Christmas Cake? Today's prompt is "holiday food". And since I've already drawn latkes in my journal, I decide to go with another holiday food. Even though I grew up in Shinto/Buddhism traditions of Okinawa, Christmas was celebrated by most Japanese. For us, it was a secular holiday with gifts and festive decorations. 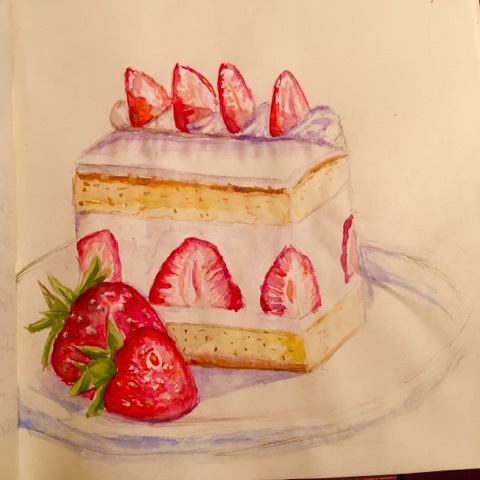 One of the Japanese traditions of Christmas is to eat the Christmas cake which is a sponge cake layered with whipped frosting and fresh strawberries. My stepfather who grew up in Pennsylvania loved another Christmas favorite, the fruit cake. Every year, he looked forward to receiving one from his co-workers. I love most baked goods, but I just couldn't get into fruit cake, even when it was home made. I was reading about the traditions of Japanese Christmas cake and found that in the 80's, people used the cake to refer to women over 25. The cake is eaten on the 24th and by the 25th, the cake is stale. And unmarried woman over 25 were thought not worthy of marrying. How terrible! Today, when more and more woman are working and delaying getting married, this insult has lost is sting. Yay! I, for one, would have been way past the expiration date as I didn't get married until I was 34! Ha! And if you use emojis often, you know there are two cakes; one a whole cake with candles and strawberries and the other a sliced strawberry cake. Both are referencing the Japanese Christmas cake. So if you are looking for an alternative to fruit cake, try a strawberry short cake for Christmas! Yum! That looks like the kind of cake we used to get, in sheet form, for baby showers. I am one of the few people who actually enjoy fruitcake if one goes lightly on the candied fruit. My father was a mailman and every year several of his customers would give him fruitcakes to bring home as a bonus for his service. I don't celebrate but I do love the food. I've got a carton of eggnog about to reach it's sell by date so I think I'll make a cake with it. Double, sugar spiking, yum! You have a safe and enjoyable weekend, Angelcake.